Diversity and inclusion isn’t limited to company walls or country boundaries, says Raymond M. Brown. Hislife work fighting global human-rights violations started in a low-income housing project in Jersey City, N.J.His values and priorities were set early on by his father, Raymond A. 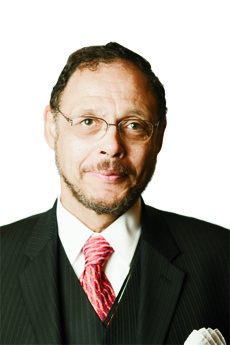 Brown, a noted criminal attorney and civil-rights activist who defended Rubin “Hurricane” Carterand Joanne Chesimard. “My dad was easily the greatest human being I’ve ever known because of his tremendous compassion for people, especially the underdogs. This influenced every aspect of my life,” says Brown, who is a partner in Greenbaum Rowe Smith & Davis’ legal department and chair of the White Collar Defense & Corporate and International Human Rights Compliance Group. Brown was raised in what he calls a “Jim Crow housing project,” the Booker T. Washington complex. After a childhood watching his father organize protest marches and fight David vs. Goliath legal battles, he wanted to be anything but a lawyer. He attended Columbia University, where the late 1960s student protests were getting under way, and he became an activist in the Black student movement. As a result of charges stemming from a confrontation between police officers and protesters, Brown “became the football in an important legal battle.” He wasn’t convicted and was never indicted, and the legal experience made him decide to become an attorney. “I realized that lawyers are the core who can challenge the legal system,” he recalls. He went to law school at the University of California, Berkeley, where activism and legal knowledge went hand in hand. As he launched his legal career, the people he’d met through his father globally made him want to explore human-rights ramifications in and outside of the United States. This “natural progression, intellectually and personally,” led him to an astounding career, domestically and globally. In the United States, where he’s specialized in white-collar crimes and corporate compliance, he’s appeared in high-profile trials, including the trial of former Labor Secretary Raymond J. Donovan and the successful eight-year defense of senior executives of a large corporation charged with environmental violations. Globally, he’s conducted investigations in Kenya, East Africa, El Salvador, the Cayman Islands, Switzerland, the Bahamas, Colombia and Sierra Leone. What jump-started his work for human rights was being asked to be an anchor on Court TV, reporting on war-crime violations. He has continued his legal/journalism career, hosting the Emmy Awardwinning New Jersey Network Program “Due Process” and often serving as a legal analyst for broadcast programs. He has also taught international criminal law at Seton Hall University, has been a prolific public speaker and has received numerous awards, including the Award of Excellence from the Thurgood Marshall College Fund, the Distinguished International Award from the National Council of Women in the USA and the Van Y. Clinton Award for “excellence as a tireless advocate for just causes” from the Garden State Bar Association. His trial experience has included criminal cases, serious violations of international humanitarian law, RICO violations, environmental pollution and internal investigations for public and corporate clients. As a result of these experiences, Brown has pioneered the development of a new practice area, working with corporations to make them aware of the risk-assessment and business benefits of their involvement with human-rights causes. “A C-level person says, ‘Wait a minute. Think of the short-, mid- and long-term requirements of regulations and how we’re perceived at a time when businesses are required to act as sovereign entities.’ There is a profound transformation now culminating in a way that affects businesses,” he says, and their efforts toward diversity and inclusion.